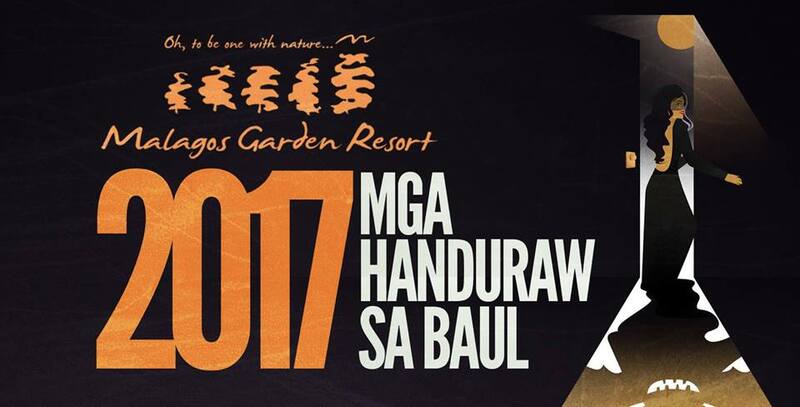 Malagos Garden Resort adds spice to halloween as it brings back Mga Handuraw sa Baul -- A Night of Music, Movies and Mythology, now on its second year on October 28, Saturday, from 10:00 AM to 12 midnight. Mga Handuraw sa Baul aims to bring families together for a night of music, games, film and food under the resort’s advocacy, “Support Local,” a celebration of the cultural significance of Philippine mythology and superstitious beliefs through local arts. Fun Handuraw activities include Crafts & Clothing Bazaar (featuring homegrown food, artworks and merchandise). ; Food Stalls, where you can make your own cotton candy; Malagos Horror House; Neon Playhouse; Bounce City; Trick or Treat for children; Halloween costume contest; screening of Ngilngig Films; and more. Discounted rooms packages are also available for Handuraw guests. Indie musicians both from Davao and Manila, such as CRWN, Jensen and the Flips, Clara Benin, Anne Mendoza, BP Valenzuela, RJ Manulid and She’s Only Sixteen, are also set to perform. “We are very humbled and grateful to be able to continue this endeavor. Through the help and participation of these very young and talented people, we hope to create an impact to the society on the importance of supporting local – from food, to products, to arts and everything in between," said Charisse Puentespina, managing director of Malagos Garden Resort. General admission of Php600 per person, includes an all-access to resort attractions, such as the first and only Chocolate Museum in the Philippine, swimming pool, Petting Zoo and Bird Feeding Dome. Thanks for checking where I'm at. I'd be sharing stories and memories to record my whereabouts, be it to great eating places or simply to a place elsewhere that is worth taking a snap. Where you at is an urban way of asking, "where are you?". It is usually spoken on the telephone to determine someone's location. This expression has been used for years in the hood and has been around long before cell phones existed. Pampering Myself With "My Skin Essentials"
Fancy A Facial? Let My Skin Essentials Facial and Skin Care Center Pamper You! I Ate Like A Viking at Vikings!